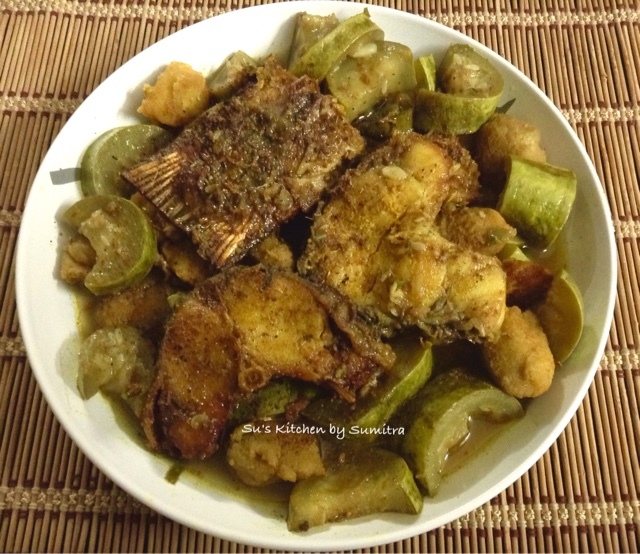 Usually bottle gourd and prawns or bottle gourd and bori is very famous among the Bengali dishes. This time I wanted to try a bit different dish. Tried to recreate this dish. This dish is eaten with steamed rice. Hope you will like it. Grind all the above ingredients except the oil in a grinder. Don't add extra water. Mix the batter very well in one direction. Heat oil in a wok till the smoking point. Lower the flame. Add half tsp spoon of the batter. 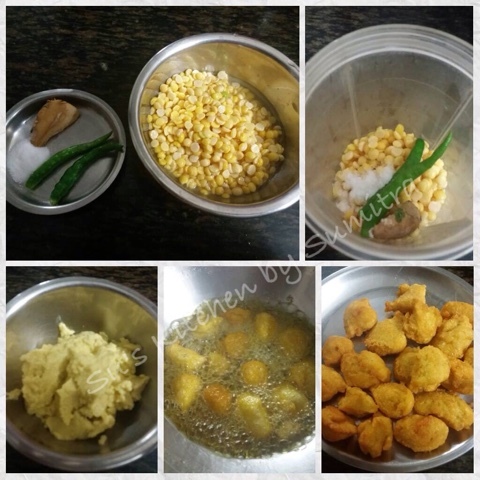 Add the batter 8 to 10 times in the oil, fry till brown in colour. Remove the fritters and keep aside. Take the fish and marinate the fish with turmeric powder and salt for 15 minutes. In the same wok, heat the oil. 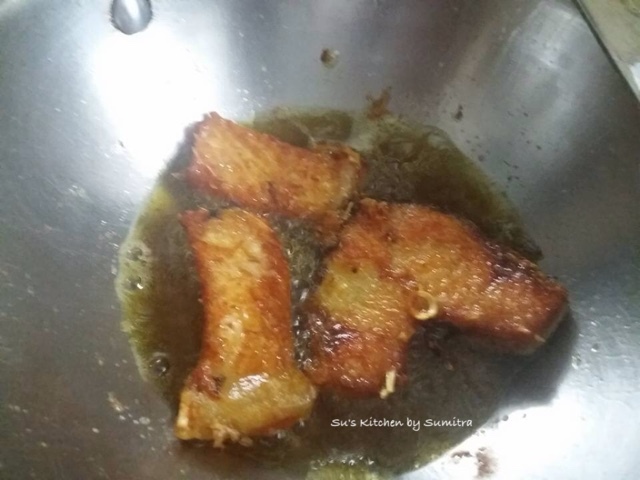 Fry the fish until brown in colour from both the sides. Take a wok. Add ghee. Let it heat. Add the cumin seeds and slit green chillies. Let the cumin seeds crackle. Add the ginger chilli paste. Sauté it for 2 minutes. Add the bottle gourd. Stir and cook for 2 minutes. Add 3 cups of water. Let it simmer. Add the salt, turmeric powder, cumin powder and garam masala. 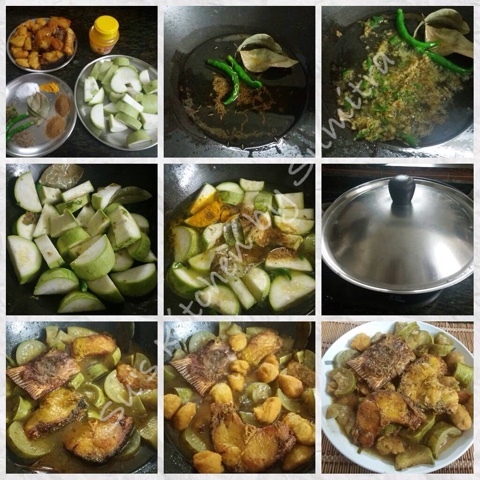 Cover and let it simmer till the bottle gourd is almost cooked. Add the fish. Let it simmer for 2 minutes. Add the Matar dal fritters and simmer for another 2 minutes. Once done. Sprinkle 1/4 tsp Garam Masala and drizzle 1/2 tsp ghee before serving.